Biryani, a unique rice dish is relished by millions of people all over the Indian sub continent. It is made up of rice,spices and meat.In a way it can be compared to the casserole dishes of the west where all the ingredients are assembled and cooked together.It is a unique combination of rice, meat,yogurt and various spices, sometimes as many as 21 spices which include exotic spices like saffron and rose petals. 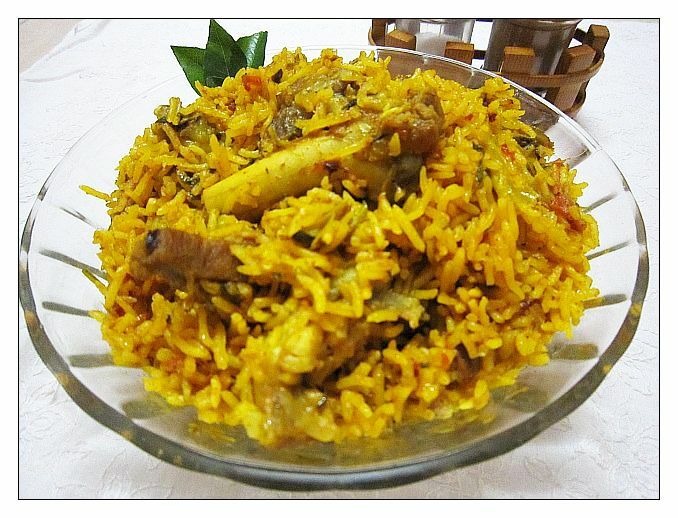 The most common version of Biryani is with meat and chicken, though in many homes all over India, the vegetarian version is also made, and is usually called Tehri or vegetable Biryani.Depending on the region it is made in, Biryani comes in various styles like Hyderabadi Biryani, Lucknawi etc each with its own distinctive regional touch. Biryani is usually served with raita,korma or curry. Wash and Soak the basmati rice for at least 8 to 10 minutes, Wash and cut the mutton and set it aside. Heat up the pressure cooker add oil, elaichi, tejpatta, leave till it become's brown, Add onion, ginger garlic paste fry for 2mints, then add mutton, turmeric, and salt, fry it till the mutton starts leaving oil, Then add the all masala's stir it for 50sec, Add tomato, curd, lemon, green chilly, pudina and coriander leafs cook for 2 to 3 whistle, in a medium flam (NOTE DONT ADD ANY WATER IN THE CHICKEN) In a mean time, Half boil the rice in a seprate pan. add water in to rice as per it required's, Allow the pressure to go completely from the pressure cooker, Then in a big pan add the mutton and the rice mix it up slowly..
Cover the lid and cook till the rice is completely cooked in a low flame. Cant take my eyes from the click, irresistible briyani..very tempting.. 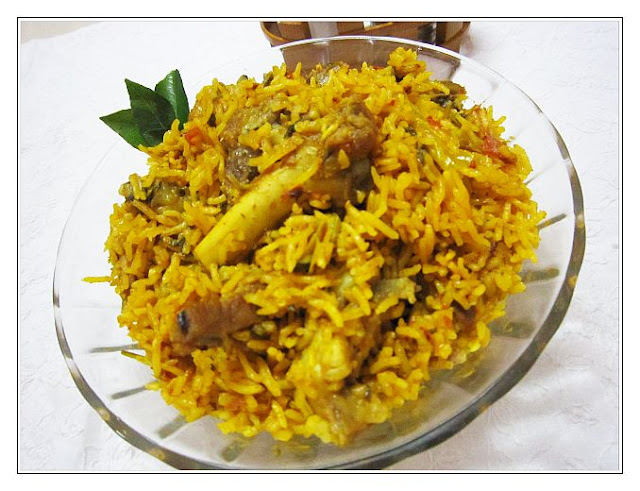 I really want some briyani now, looks very tempting. Looks spicy and delicious.. amazing recipe !! Nobody can resist this yummy biryani! Pass me some please..
Oh wow!!! looks so delicious..wanna have some now..yummy!! looks so perfect and scrumptious..
How are you? I like this recipe. I have noted your spices and cooking method. I am going to try it as soon as I am back from my trip to Calcutta. wow..v tempting..lov to a plate! You are biriyani queen, looks delicious. Tempting biryani..btw perfect timing too.. i was looking for mutton biryani recipe and yours sound delicious and doable.